GE Healthcare relatively an unknown name in the field of technology haS come with highly advanced software, which can capture the heart beating in 4D rendering. GE Healthcare is A pioneering medical imaging company which has successfully created the “cSound”. cSound is a highly advanced and one of a kind cardiovascular ultrasound scanner which can easily render the human heart in its life like dimensions even in real time fashion. GE Healthcare haS done some advanced and we aspiring work in medical imagine segment and its cSound encapsulated the best of techniques to provide best display of beating heart in real time. cSound essentially collects a wide amount of data from various sources and processes it immediately. The software incorporated in this technology stores this data in machine’s memory for future analysis. Later on complex algorithms are utilized by the machines to create a revolutionary and one of a kind unique and high definition pixel-by-pixel images in its display. The gadget possessing this technology also comes loaded with built-in color maps, which can easily color-code the different parts of the heart ranging from the arteries and valves to even the ventricles. 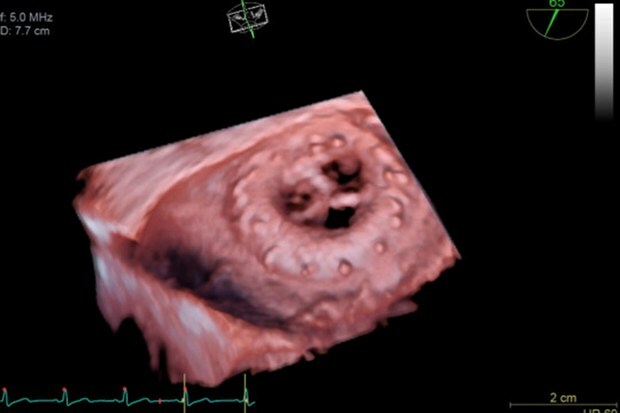 This will allow the cardiologists to understand and detect anything unusual in different part of heart in quick fashion. cSound works with using the sound waves which is based on transmitter and receivers used in the seismology, radar and WiFi communications rather than relying on radiation. GE Healthcare has taken inspiration from the ultrasounds cans which are basically used during the pregnancy to develop this technology. GE software engineer Eric Steen further clarifies that this technology uses a similar kind of algorithm with some much needed differences and tweaking to provide unique image rendering solutions for watching the beating heart. He states that the aim of getting 4D foetal imaging is at viewing the smooth surfaces of the skin. On other hand, the cardiologists had to see the differences in the heart tissue for better understanding of the heart. Hence, color maps are also built in the software to ensure that the cardiologists get the best view possible for undertaking various surgical procedures with distinction. GE developers of this smart and revolutionary technology are upbeat about its positive effect in carrying out various heart related diagnostics. It will certainly improve the accuracy of the diagnoses of heart conditions to a great extent along with reducing the need of getting expensive additional tests. Furthermore, it can even be used on the patients who are currently hard to scan like those suffering from ling diseases. Some cardiologists who had tested this technology were quite surprised by its image rending solutions. A cardiologist at Wisconsin’s Aurora St. Luke’s Medical Centre named B Khandheria had stated that the images collected by this technology is exquisite and almost looks like opening the chest and seeing the beating heart in itself.